Davide Giugliano (Ducati Superbike Team) has taken pole position in wet and treacherous conditions at Donington Park. Joining him on the front row will be Leon Haslam (Pata Honda WSBK) and Marco Melandri (Aprilia Racing Team). Giugliano’s lap time of 1min 44.903secs was enough to secure him pole, despite a fall in the closing seconds of the session. Giugliano has dedicated his second career World Superbike Championship pole position to the late Andrea Antonelli. The second row comprises Alex Lowes (Voltcom Crescent Suzuki), Sylvain Guintoli (Aprilia Racing) and Loris Baz (Kawasaki Racing). Tom Sykes (Kawasaki Racing) will start from seventh on the grid ahead of Jonathan Rea (Pata Honda) and Toni Elias (Red Devils Roma Aprilia). Sykes doesn’t think it isn’t ‘as bad as it looks’ after a necessary set-up change lost him the chance to improve, while Rea made a costly mistake resulting in a fall in the latter stages of the session. Bryan Staring has been forced to delay his World Superbike debut with the IRON BRAIN Grillini Kawasaki team after injuring his arm at Donington Park. The Australian, who has come into the Italian team to replace Michel Fabrizio, has been contending with an arm injury throughout the weekend, but after struggling on the first day of competition, the decision was taken to focus on full fitness for Sepang. Injury keeps Bryan Staring out this weekend. After an exciting yet crash filled session it was Michael van der Mark (Pata Honda World Supersport Team) who claimed pole position ahead of Kenan Sofuoglu (Mahi Team India Kawasaki) and Kev Coghlan (DMC-Panavto Yamaha) for tomorrow’s 20 lap race. PJ Jacobsen (Kawasaki Intermoto Ponyexpress), Marco Bussolotti (Lorini Honda) and Alessandro Nocco (San Carlo Puccetti Kawasaki) will make up row 2. 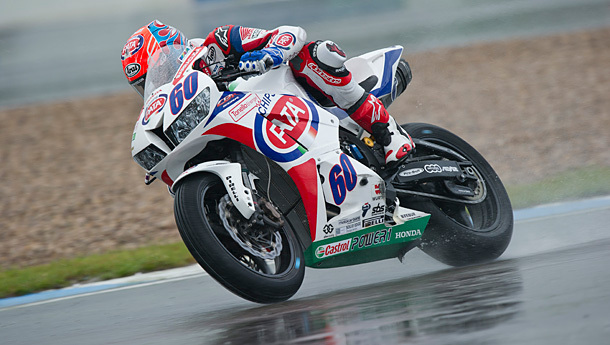 Michael van der Mark on pole for tomorrow’s World Supersport race. Jack Kennedy fell victim to the conditions on his first flying lap, losing control of his CIA Insurance Honda at McLeans corner but was able to remount and return to the garage, giving his mechanics some work to do. Fabio Menghi (VFT Racing Yamaha) slid off at the fast Starkeys sections and was taken to the medical centre for precautionary checks while Tony Covena (Kawasaki Intermoto Ponyexpress) also crashed at the infamous McLeans corner. Raffaele de Rosa (CIA Insurance Honda) joined the ever growing list of fallers, high siding at the final turn. His team-mate Nacho Calero also had an off track moment but was able to keep his Honda on two wheels before he too came to grief at Coppice with 15 minutes to go. Florian Marino (Kawasaki Intermoto Ponyexpress) was a mid-session faller at the esses, the current joint leader of the series thankfully able to walk away unhurt. Fellow Frenchman Jules Cluzel (MV Agusta RC-Yakhnich Motorsport) fell in the final five minutes at Goddards as Fraser Rogers (SMS Complus Honda) and Alessandro Nocco (San Carlo Puccetti Kawasaki) both fell at McLeans.